Coach Schooley brings us another drill designed to work on breakout passing and 1 on 1 play. Drill runs from both ends at the same time. Make sure that the defensemen work the reverse pass at game speed and are positionally sound. D2 should hold the front of the net with his skates up ice until the reverse pass is made and then he should sprint to the puck, get his head up and make the breakout pass. Coach Schooley brings us another drill today. This one works on the breakout, regroup and 2v1 play. The drill runs from both ends at the same time. 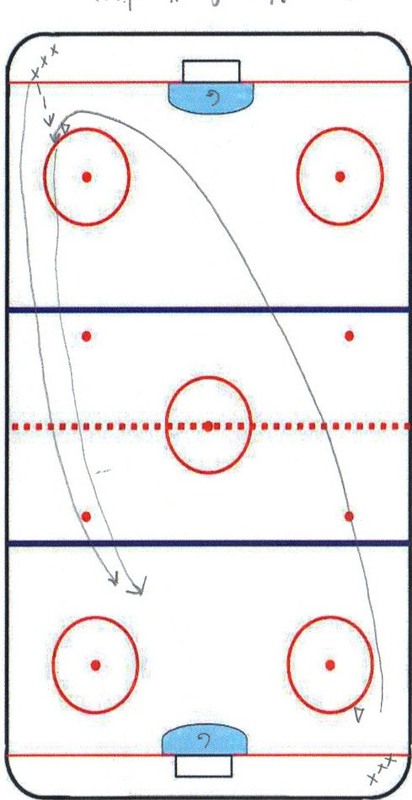 To avoid some confusion in the diagram of the drill, we only show one side skating the pattern, but both are going together. I think the attached video shows the drill in action pretty clearly. Robert Morris University Head Coach Derek Schooley gives us this drill today. The drill is designed to work on the breakout pass from the D to Forward down low, followed by the all important second pass to get your team out of the zone. 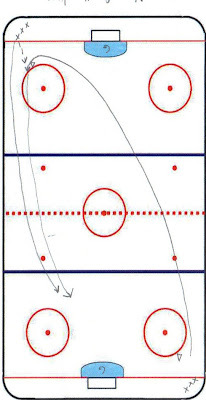 For this drill, the second pass is a chip off the wall to F2 coming through the neutral zone with speed. This is a simple drill in design, but a skill that many players have trouble executing. The ability to chip a puck off the wall, behind a pinching D, into an area of the ice that allows a forward to pick the puck up in stride with speed, is a very important offensive skill to develop in your players. This drill is brought to us by Peter Russo, who is an assistant coach at The Brooks Prep School in North Andover MA. Peter also runs a website where he shares his ideas about all things hockey. You can visit his site at www.coachprusso.com . Got this drill from my friends at Hockey Canada. Worked it at practice last night and it looked good once we got the hang of it. The drill works on supporting the puck with the weakside D as well as transitioning to offense using the forward cutting through the middle. Make sure your D concentrate on the D2D pass as well as the initial transition pass to the forward. You can add a D at the other end to make the drill a 2v1 if you prefer. I’ve used this drill for years to help develop the skating skills of my defensemen. It works many of the fundamental skills a good defenseman needs to play at a high level. If you have the ability to split your ice to work with the defenseman, this is a great drill to add to your practice plan. Be sure to run it on both sides of the ice. I received this drill from Coach Eaves last year, but thought it would be good to highlight again as we begin to prepare for the upcoming season. I use this drill a lot because it works a number of areas in a quick moving drill. Players need to concentrate on good passing and receiving skills, timing, speed through the neutral zone and attacking the net. There are a few options for this drill. You can have the D be the players in the corner so they can work on the outlet pass, or you can have all the players work both parts of the drill to gain confidence in the outlet pass. You can also have the player from the corner turn to the outside to receive the pass and attack the zone wide. Also, be sure your goaltender is concentrating on directing his saves away from the front of the net.